Florida House Members May Get Handheld Email | BlackBerry Blast! According to a USAToday report, Florida House speaker Johnnie Byrd wants all 120 state House members to have hand-held e-mail devices. Instant two-way e-mail communication would help legislators, Byrd said in a recent e-mail to House members. 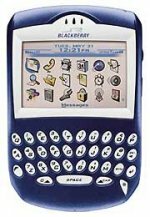 "Knowing the fast pace and heavy demands on your time resulting from being a 'part-time legislator,' I have made arrangements to offer each member a BlackBerry 6510," Byrd wrote Aug. 19. "With this device your staff can communicate with you anywhere, any time, without the interruption of a cell phone call." According to the report, Florida Governor Jeb Bush uses a BlackBerry while traveling, but he pays for the device himself avoiding any kind of public scrutiny on the issue. House members already have cell phones and laptops with Internet access in their offices and on the floor during sessions. It appears that the House speaker wants them to have the always on, instant email as provided by the Blackberry.